A slim margin of victory in the Chippewa Valley helped propel Tony Evers to an even narrower statewide win over incumbent Gov. Scott Walker on Nov. 6. Evers, a Democrat and the state superintendent of public instruction, unseated Walker, a two-term Republican, by just over a 1 percentage point margin. 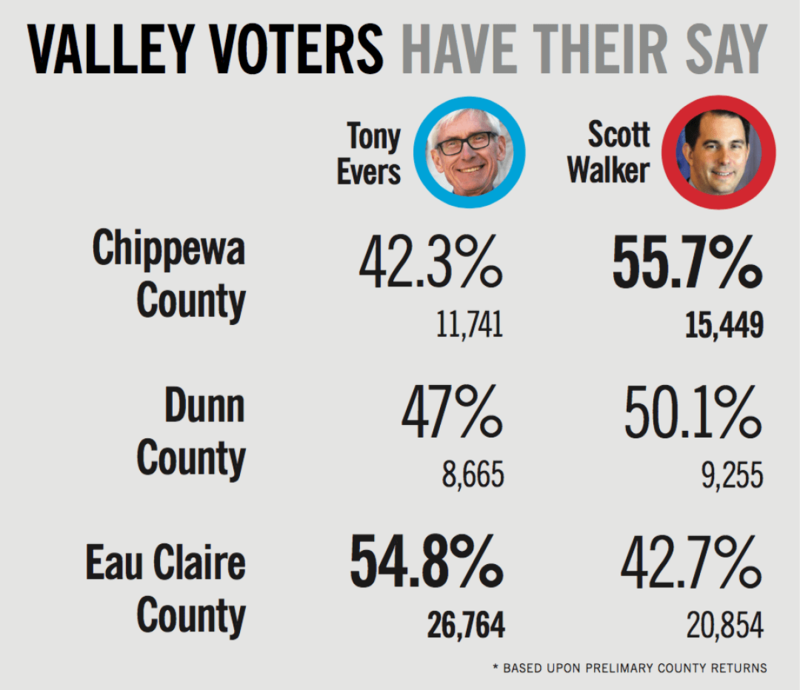 Evers garnered just under 50 percent of all the votes cast in Chippewa, Dunn, and Eau Claire counties, compared with about 48 percent going to Walker. Evers won 55 percent of the vote in strongly Democratic Eau Claire County, while Walker came out ahead with 56 and 50 percent of the vote in GOP-heavy Chippewa and Dunn counties, respectively. Considering the red-blue divide in past elections in the region, the county-by-county results aren’t surprising, although it’s worth noting that Evers outperformed Democratic presidential nominee Hillary Clinton’s 2016 vote share in all three counties. Statewide, Evers squeaked out a victory by a margin of just 1.1 percentage points – just over the margin of 1 percentage point that would have allowed a recount. As governor, Walker had signed into law a bill that limited recounts to elections that were within 1 point. • Jodi Emerson, a Democrat, defeated Republican Echo Reardon to win the 91st Assembly District seat currently occupied by Democrat Dana Wachs, who didn’t seek re-election. The 91st District encompasses most of the City of Eau Claire. • Democrat Jeff Smith of Eau Claire beat Republican Mel Pittman to replace state Sen. Kathleen Vinehout in the 31st District, which includes Eau Caire and areas to the south and west. • Republican Kathy Bernier defeated Democrat Chris Kapsner for the open seat in the 23rd Senate District, which encompasses all of Chippewa County and parts of Eau Claire, Dunn, and other counties. Bernier will replace retiring State Sen. Terry Moulton, a Republican. • Republican Jesse James will replace Bernier in the 68th Assembly District, having defeated Democratic contender Wendy Sue Johnson for the open seat. • Eau Claire native Sarah Godlewski was elected state treasurer. Godlewski, a Democrat and Memorial High School alumna, earned 51 percent of the vote in the race against Republican Travis Hartwig. • Eau Claire County voters overwhelmingly approved a nonbinding referendum calling on the state Legislature to create a nonpartisan process to draw legislative and congressional boundaries – in other words, to bring an end to gerrymandering. The measure got a “yes” from 74 percent of county voters. • By an even larger margin, Eau Claire County voters also said they were open to decriminalizing cannabis. In a nonbinding referendum that had three possible responses, 54 percent of voters said people 21 and older should be able to use marijuana for medical or recreational use, and that the drug should be “taxed and regulated like alcohol.” Another 31 percent of voters said that marijuana should be legal only for medical purposes, while the remaining 15 percent said pot should remain illegal.